Want a laugh? 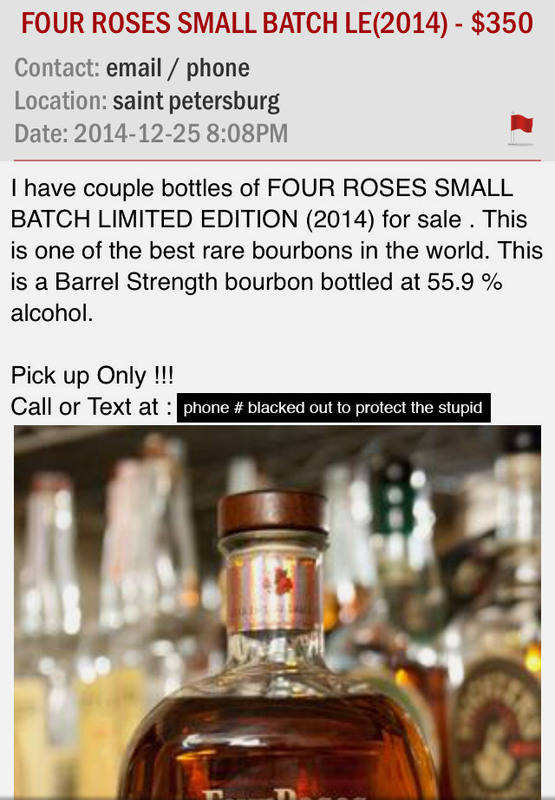 Go troll Craigslist looking for bourbon. You will find legitimate collectable items of both the liquid and memorabilia types. But mixed in among the legit collectables are those that people only wish were collectable. Folks looking to make a buck (or hundred) by preying on the unsuspecting and uninformed. A while back, I solicited people on twitter to send me some of their favorites. What follows are the ones I liked best out those submissions. Thanks to all who participated. Let's start with something that really is hard to find, But seriously? This is over a 300% markup. Glad to have paid gift shop prices for mine. That's a little better. Only a 200% markup (roughly). It must be on sale though. I mean "Ther prise is Final !" after all. "It may not have the same demand as (That which will not be named) but that won't stop me from charging the same price as it." I was starting to worry that this guy wouldn't be able to feed his family after the last two which were listed at only a 200% markup. But here we are, back to 400% or so. whew! I like the bourbon...but damn. 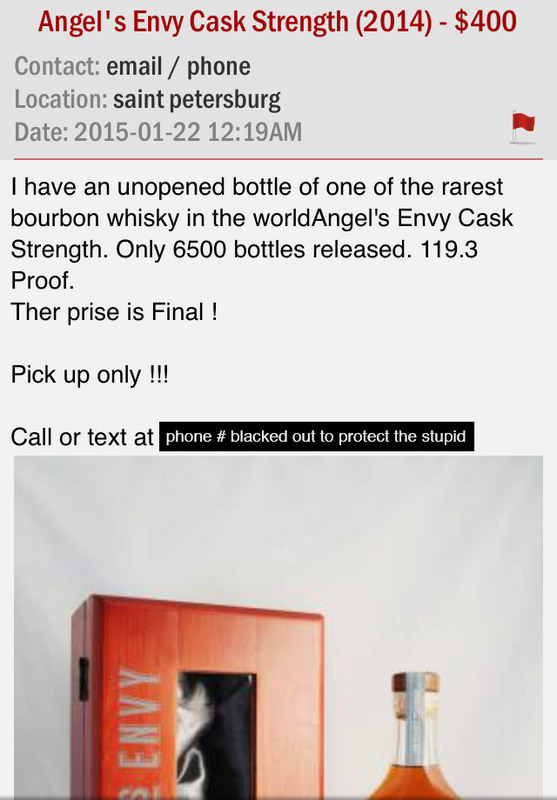 In case you were curious, you shouldn't drink this $100 bourbon. It's for display only. Apparently if you leave the city, the price drops. Those poor suckers in Champaign/Urbana. (shakes head) But if you want tasting notes with your gouging, this is your guy. 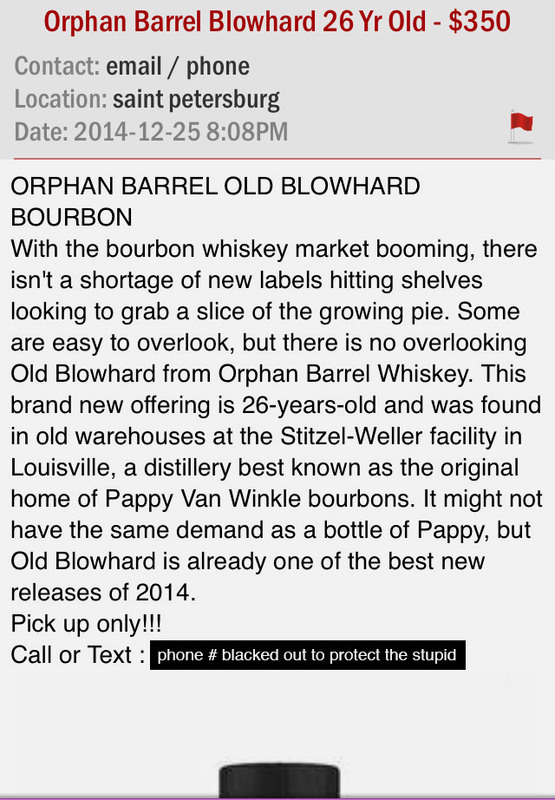 $125 for a liter of "Poor Man's Pappy." Apparently the definition of poor is different in Missouri. Having traveled through much of it, I wouldn't have guessed that. It's Booker's! with keywords of Buffalo Trace, Angel's Envy and (That which will not be named). 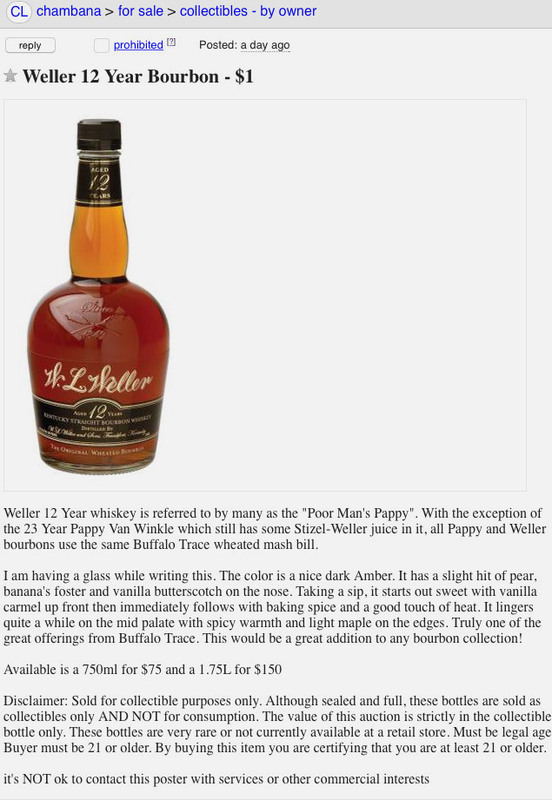 It's impossible to find as shown by all the Weller 12 listings we've found. Though by this point in the list, this asking price feels almost...reasonable. Damn! Man! At least leave the store parking lot before you sell that collectible bit of HAZMAT! Can't leave my home town out, can I? Feel like trading your Booker's 25th, Four Roses Limiteds, or Buffalo Trace Antique Collections for a bit of Old Weller Antique 107 proof? Yeah, me neither. Nothing seems shady here. $75-$100 for an ounce and a half of liquid in an unmarked bottle? Or I can get all 12 and save $100!?! Where do I sign up? And before you think it's just folks who don't know bourbon, here's one from the heart of Bourbon Country. I just want to know how much he's charging for that collectible mason jar filled with a "representation of a 50/50 mixture that has mingled for two weeks" in a mason jar. I mean, I'd also imagine it'd be delicious (if it were intended for consumption).